Last week I posted a recipe for easy suet cakes for chickens. One of the ingredients I used was flax seeds. I received several emails asking about flax seeds and why I feed them to my chickens...so I decided to answer that question publicly. I've been feeding flax seeds to my chickens for about 6 years now and I started adding flax to their feed to increase the Omega-3 content of their eggs. I eat flax seeds on a daily basis because they are high in protein, fiber, omega-3s and antioxidants. After I started adding flax seeds to my diet I noticed the 'expensive' eggs in the store with labels that touted their Omega-3 content. Since the nutrition of a hens egg is a direct result of their diet, I concluded that it had to be that chickens diet which added the Omega-3s to the eggs. I had recently found a great deal on a huge bag of flax seeds so since I had them on hand I started adding flax seeds to my chickens diet. I mix them into their scratch grains, add them to treats and bake them into flock blocks. The chickens seem to like them and I felt like I was adding something nutritious to their diet. ...and while I've never had their eggs tested for Omega-3s (if that's even such a thing) I have good reason to believe that it helps. I decided to do some research to find out if adding something like flax seeds to my chickens diet can increase the Omega-3 content of their eggs. I didn't have far to look. I found this article from HealthLine titled Pastured vs Omega-3 vs conventional eggs. Whats the difference? It turns out that flax seed is added to chicken feed to increase the Omega-3 content of eggs! How easy is that? It gets better though! I found a lot of information on adding flax seeds to chickens diets including this article that states "Flaxseed is unique among oilseeds because it is high in alpha-linolenic acid. Flax is one of the most concentrated sources of unsaturated fatty acids available in poultry feedstuffs. Oil composes 35% to 45% of the content of flaxseed, and 45% to 52% of the oil is alpha-linolenic acid." and "Feeding flaxseed to laying hens results in a six- to eight-fold increase in the omega-3 fatty acid content of eggs." I try to make flax seeds about 10% of the hens diet. I decided on 10% after reading this article from Main Organic Farmers and Gardeners Association where they recommend no more than 10% flax seeds. 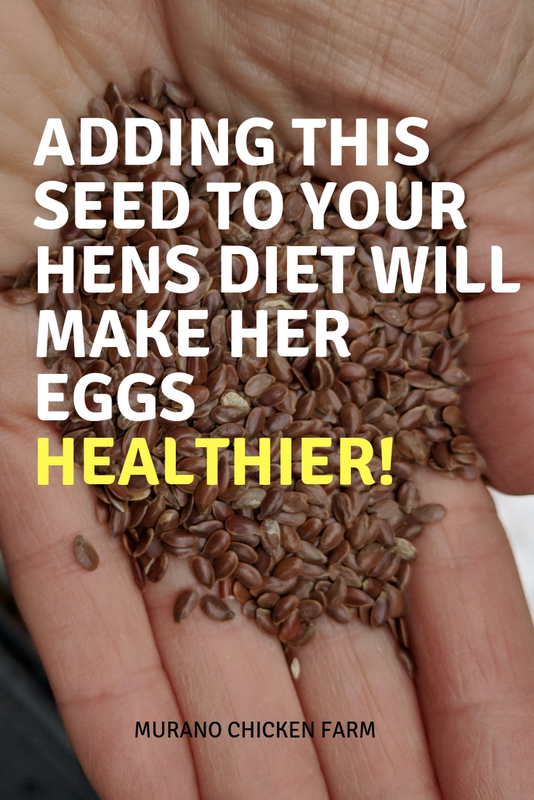 Feeding more than 10% of a hens diet in flax seeds will start to affect the flavor of the eggs negatively. Whole or ground flax seeds? You can buy flax seeds either whole or ground. When people eat flax seeds it's recommended that they eat the ground seeds to best absorb the nutrients. Otherwise whole seeds will go through the human digestive tract and stay whole taking their nutrition with them. However, since chickens have a gizzard that is not a problem for them. When flax seeds enter the chicken's gizzard they are ground up along with the rest of their food. The small rocks and grit in the gizzard break up all seeds including flax. Once the inside of the seeds is exposed, the chicken can absorb the nutrients from the flax seeds. Another reason that I do not feed ground flax seeds is that once the seeds are ground they start to lose their nutritional value. Whole flax seeds have a much longer shelf life than ground seeds allowing me to stock up when I find them on sale! Of course you can feed them either whole or ground flax seeds. They have the same exact nutritional quality as long as the ground seeds are fresh. So there you have it! That is why I feed flax seeds to my hens. 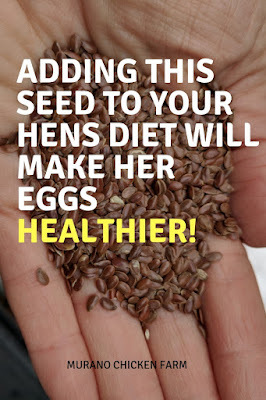 I think they like them and from the research I've done I believe the flax seeds are adding a nutritional boost to my hens eggs. Are you new here? Check out my top posts on chicken health, care and feeding! When you mix flax seed with chicken feed do the chickens want to pick out the flax seed? I haven't had that problem. They seem to eat them both equally.